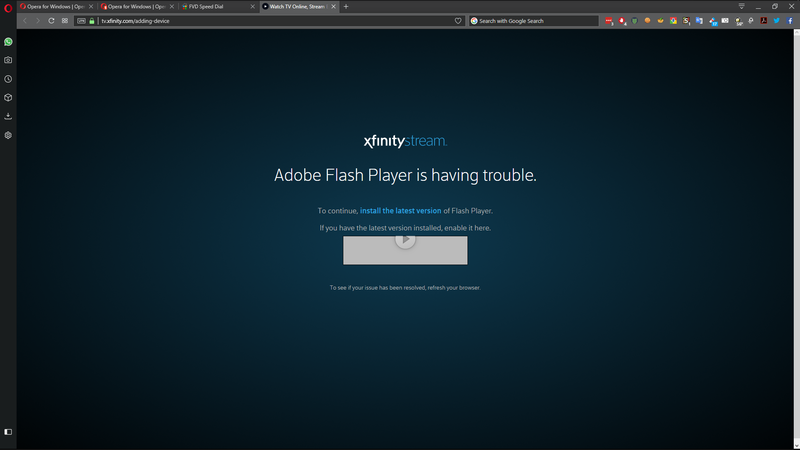 i get the following message every time i want to log into and watch videos on xfinity. i can watch the content just fine through chrome. both browsers have the exact same extensions except for the screen capture extension. i'm on windows 10 64 bit build 16299.19. i have once again reinstalled the latest flash player. any ideas and or suggestions would be greatly appreciated. "Adobe Flash Player is having trouble. To continue, install the latest version of Flash Player. If you have the latest version installed, enable it here." Do you have VPN or Turbo enabled? They will turn on 'click to play', which is what you are seeing. Try clicking on the arrow in the gray block or just add the site as an exception. spoton worked perfectly turning off turbo and browsec. thanks for the quick fix.